You are here: Home » Encouragement » Why Adoration? As one who regularly attends the Sacraments of the Church each week I have noticed that there is a huge difference in numbers between those who attend Mass and those who attend Adoration of the Blessed Sacrament, and I have wondered how this could be. Admittedly, one would expect a greater number to attend Mass as there is a greater obligation placed upon them to do so. Also, one might assume that you receive more from the Mass than you would from Adoration, as in Holy Communion you actually partake of Jesus in a physical manner. However, the difference in attendance is so great that I believe Adoration is a practice that is not fully understood, or is possibly grossly under valued. Adoration of the the Blessed Sacrament within the Catholic faith is a common practice among many churches and has been for a great many years. Like many church practices it has evolved and developed over time as the Lord has guided. The belief that Jesus is truly present in the Blessed Sacrament is not a teaching that has been developed over time, but one that comes directly from the teachings of Jesus Christ Himself and which He gave us whilst living on earth. The earliest Christians had no doubt about the true presence of Jesus in the Blessed Sacrament, among the many writings of Early Church fathers Justin Martyr writes: “We call this food Eucharist… not as common bread nor common drink do we receive these…the food which has been made into the Eucharist by the Eucharistic prayer set down by Him, and by the change of which our blood and flesh is nurtured, is both the flesh and the blood of that incarnated Jesus” (First Apology 66 [A.D. 151]). And finally: Here, I am entirely yours, soul, body and divinity as Your Bridegroom. You know what love demands, one thing only, reciprocity. (Diary 1770) Jesus to St Faustina. So we know that Jesus is present in Holy Communion, and the need for Him is obvious, but why adoration? Why attend Adoration if Jesus is within us through receiving Him at Mass – especially when Adoration is very often directly after Mass? Let me ask you a question: If you could go back to the time when Jesus lived upon the earth, and you heard that He was close to your village or town, would you go and visit Him? Yes? Okay, now let’s say you get there and you find Him feeding the multitude, would you stay and eat? Yes? And when you had finished eating, if Jesus said He was going to stay for a while and sit quietly listening to the prayers of those before Him, would you stay and speak with Him? Or having eaten would you leave? I think the answer will be that you would stay with our Lord. Yes, so many would wish to spend time in the presence of Jesus for as long as possible. So why don’t we? Why when Mass is over and Adoration begins do so many leave Jesus sitting upon the Altar in the monstrance? Is it that we only have a certain amount of time? Or is it something deeper? Do we truly believe that Jesus is present, Body, Blood, Soul and Divinity? I once heard the story of a Priest in the seminary who whilst giving his students a lesson on the Real Presence of Jesus in the Eucharist had a unique way of revealing to the students the depths of their own beliefs: The teacher would go to the Tabernacle in the Chapel, collect the Ciborium containing the Host and bring it before the students. “You know what I have here” he would exclaim! Then he would ask, “do you truly believe Jesus is present in these wafers of bread?” Then tipping the wafers onto the floor, he placed his foot down hard and trampled them into the ground! A gasp of shock and disbelief was heard from the bewildered students as they sat there in shock at what they had just witnessed. The teacher would then explain to the students that the wafers he had brought from the Tabernacle were NOT consecrated and therefore where just bread and not the True Presence of Jesus. But he told the students that what they had felt in their heart’s at the time of his actions, had revealed to them the depth of their belief. This lesson may seem a bit drastic, but how do we know how deeply we believe in something unless our beliefs are tested? This entry was posted in Encouragement and tagged Adoration, eucharist, prayer. Bookmark the permalink. 2 Responses to Why Adoration? I agree with the sentiments expressed in this article. 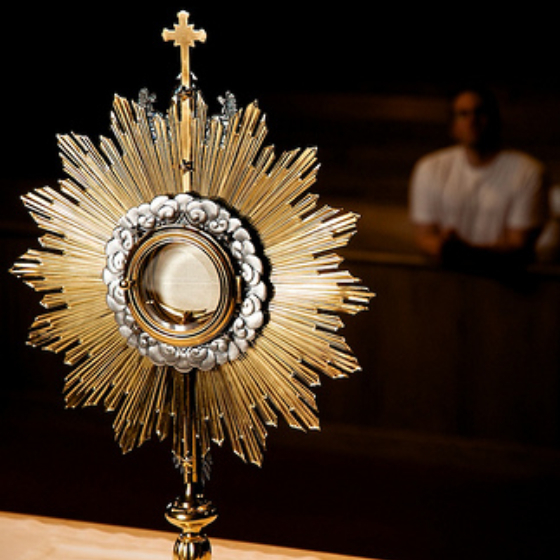 Adoration is a beautiful experience. In September this year in Liverpool, England there is going to be a conference, Adoremus, dedicated to Adoration of the Blessed Sacrament and in preparation for this our priests have been asked to offer Adoration weekly in all parishes.